I stumbled upon the blog 52 Brand New sometime in our homeschooling journey and I was really intrigued with the idea of doing something new every week. New experiences-- even seemingly silly, small things leads to new discoveries, learning and connections. Last year looking back through our year I complied a list of 52 Brand New Experiences and knew I wanted to try and come up with 52 more for this year. It actually wasn't all that hard; we try new recipes, new playgrounds, new craft projects and science experiments all the time! I had a harder time narrowing them down and deciding which ones to use! 1. Visited Nautalis Museum-- This has been on our "to do" list for the past three years and we finally made it there! We met up with a couple other homeschooling families and spent the day touring the museum and submarine. 2. Went to see Plymouth Plantation-- Another field trip that's been on my mind for a few years; we finally had a day to go and explore this year. Learning all about life in a seaside village back during colonial times. It was so much fun! 3. Went to Great Wold Lodge-- A fun family vacation night at a local indoor water park. My kids have been asking to go and ever since we came home they've been asking to go back! A fun new experience for sure. 4. Participated in an Oceanography class-- We had the chance to attend a HUGE homeschooling science class all about oceanography. It was a beautiful sunny day and we spent part of it exploring the seaside learning about local habitats and animals. 5. Evan learned to ride a two wheeled bike!-- This allowed us to start taking family bike rides around the house. 6. Alec started working in the forge and doing metal work-- after trying out a quick demonstration at Mystic Seaport Alec was hooked on learning all about forging metal. Luckily for him, my husband was left one in an uncle's will. So Alec spent a few weekend working metal. 7. We made our own sleds-- We decided to spent one winter afternoon crafting our own sleds from duct tape and cardboard. It was a wonderful, fun, hands- on STEM project we'll be talking about for years to come! 8. Checked out the Capron Park Zoo-- Each new zoo leads us to new animals and new learning experiences. While small we ended up visiting this zoo a couple of time this past year because we just loved how many unusual animals they had for us to learn about. 9. They started at a new karate school and Evan finally got to spar!-- While karate itself is not new to my boys Evan was just thrilled to start sparring. He still tells me it's the best part of his class each and every week! 10. We got a new household pet-- Fish! All that Alec wanted for his birthday last year was a pet. We got him a tank and some goldfish and have some great times learning about caring for animals; even tiny ones require a lot of work. 11. 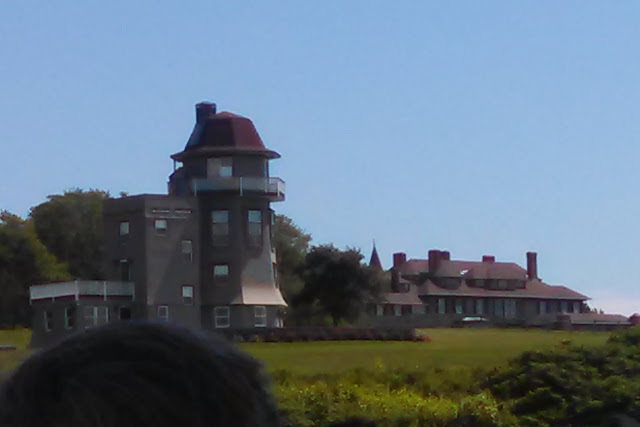 We went on a Newport Harbor Cruise and learned about the mansions of Newport-- Just going to Newport was a new experience for the kids and we had a wonderful day riding around on the boat learning all about the history of the Newport mansions. 12. We toured Fort Adams-- Our second trip into Newport found us touring an old fort. We met up with a couple of homeschooling families and enjoyed learning all about the fort seeing everything from the ramparts on top to the tunnels underneath! 13. The older two boys started teaching themselves to use Design Cad-- Ian and his dad started working on some drafting; building a bird house and working on a toy garage. Somehow along the way Ian was introduced to Design Cad and the next thing I knew the two older boys spent days and week drawing on the computer teaching themselves a lot of aspects of the program through trial and error. 14. 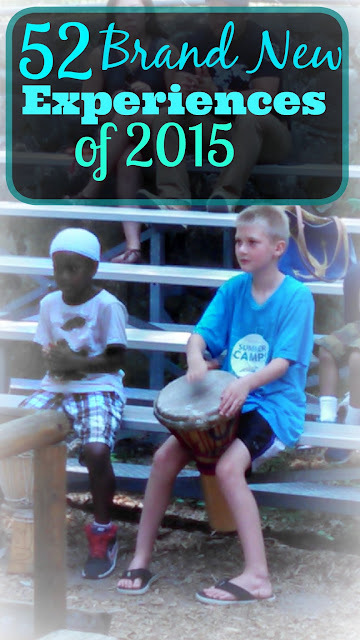 Learning all about African Drumming-- We headed to the zoo one day when they had African drummers performing. 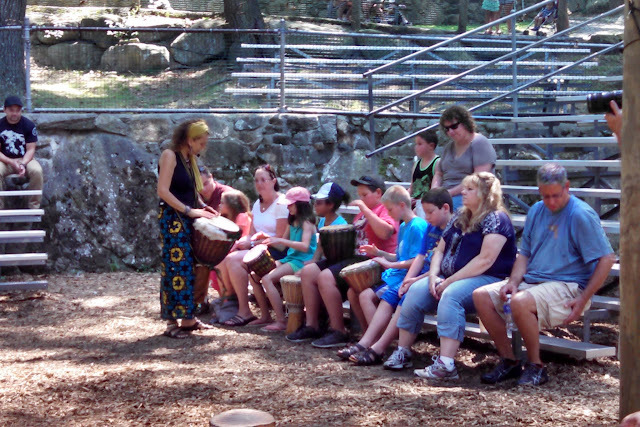 They called kids up from out in the audience and taught them all about the drums, how they were made, the different sounds they can make, and how to keep rhythm with one another. 15. Learning computer programming with Microsoft class and camp-- We had a homeschooling mom set up a field trip to the Microsoft store in the mall for a day class on computer programming. My kids enjoyed it so much they begged me to look into the week long summer camps the stores offer; best part?! They're absolutely FREE! 16. Alec learned to sew-- I try to take any opportunity I can to teach my boys life skills. Alec was so upset one morning when his new stuffed animal had a hole in it and so I offered to teach him how to sew it up. 17. We made snow shakes! We had so much snow last winter and though I try (in vain) to stop my kids from eating snow I realized that I ate tons of it when I was a kit and I'm still alive. We heard about making ice cream out of snow and tried a recipe that turned out a bit soupy so we dubbed them snow shakes and downed the yummy tasting treat. 18. We went to the Boston Science Museum (for Evan it was a new experience to just be in and see the city!) -- My husband took a day off from work and we all took a trip to the Boston Science Museum. It is HUGE (so big we could not possibly see everything in one day!). But we had lots of fun learning all sorts of new and wonderful things! 20. We all took a glass fusion class-- Meeting up with a group of homeschoolers we learned what glass fusion was and had a great time making some fused glass night lights and trivet. 21. The boys tie dyed t-shirts-- We learned how to make tie dyed t-shirts. The boys had a great time getting messy and designing their own shirts. 22. We made and tried magic bubble tea- Never having used tapioca pearls before the whole experience was completely new to us. 23. We went to the Natural History Museum; a brand new museum for us!-- We finally got around to checking out the Natural History Museum in Roger Williams park. We had a great day filling out their scavenger hunt sheets and learning about both nature and history. 24. We toured the Mark Twain house and learned about his life and work-- A fellow homeschool mom set up this amazing field trip and we had such a great day learning all about Samuel Clemens. 25. We saw a bald eagle in the wild!-- These animals are making a slow come back in our area and we were lucky enough to see a pair of them one day sitting in a tree overlooking the river. It was breathtaking! 26. We made a snow volcano! -- My boys love making volcanoes with baking soda and vinegar so last winter we build a volcano out of the snow, poured in some baking soda and then added some vinegar we had dyed red using food coloring. They had so much fun with our "snowcano!" 27. We raised ladybugs-- for a few years in a row now we've raised butterflies but this year we decided to add ladybugs too! It was so fun to watch them change and grow. 28. We learned how to surf cast-- living on the lake we get to go fishing a lot but when a local nature center offered classes on surf casting my boys were so excited. We had never fished on the ocean before! 29. We went clamming-- The same nature center that offered surf casting classes also offered clamming classes. We spent an afternoon trying to find clams in the marshes and learned about the tools, techniques, and rules of clamming. 30. We went through the car wash-- Such a little thing but it was so exciting for the boys. We had never been through the car wash; preferring to wash our own car. The place we went to had rainbow colored foaming soap that just added to the whole experience. 31. We went to Battleship Cove and toured all the ships there-- Such a fun history field trip! We spent the day with another homeschooling family touring several ships and submarines. 32. We went zip lining at the outdoor adventure park-- We had an awesome day climbing among the tree tops checking out an aerial adventure course. 33. We toured Mystic Seaport -- Another wonderful day of history lessons! 34. We went strawberry picking-- We've picked all sorts of fruits before; apples, blueberries, peaches, pears, but never strawberries. This year we decided to see what that was like; the boys were surprised to see how short the plants were. 35. We saw a live production of Percy Jackson-- a local theater was putting on a production of Percy Jackson and the Lightening Thief and we decided that we just had to go! We're such Percy Jackson fans. 36. Alec learned to cook on the grill-- All of my boys know how to cook a few dishes but this was the first time we thought to see if anyone wanted to learn how to cook on the grill. Well, Alec took to it right away and spent a week or two cooking a whole variety of meats on the grill. 37. Alec learned how to drive the lawn mower-- Alec was finally tall enough and heavy enough to drive the riding lawn mower this year. He's new to it and pretty nervous about it so he only drove it on flat surfaces at a snails pace with mu husband walking beside him but it's a start. 38. We made fizzing play dough-- We often make all sorts of sensory dough recipes. One day as we mixed up a batch of dough using baking soda the boys asked what would happen if we added vinegar to it; so I handed them each a container and a dropper and we found out! 39. We finally got around to riding the sky ride at Southwick's Zoo! !-- We go to the zoo all the time but for years we have been unable to ride the sky ride. They require one adult rider for every child and until Mother's Day when my husband and mother-in- law came with us we never had the right number of people. It was lots of fun and we saw so many animals! 40. We went digging through a vernal pool; finding all sorts of signs of life. We've observed many vernal pools but this one nature center ran a class on vernal pools and invited us to dig in (literally; we had buckets of "stuff") and see what we could find. 41. We checked out several new parks and playgrounds-- Here's one that we particularly enjoyed. Each playground offers something new and challenging for the kids to play on or play with. This particular playground had exercise equipment for adults too and the boys could not wait to try it out. 42. Playing with our new Chemistry Modeling set and learning about bonds-- a new to for learning science; such a wonderful new experience. My kids have been so interested in Chemistry this year! 43. We stopped to watch a snapping turtle lay eggs on our beach! -- Living on the lake we often see sun turtles and even a few snapping turtles but this one morning we saw a large snapping turtle dig a hole on the beach, back right up into the hole and lay eggs! It was so neat. 44. We made craft stick chain reactions-- Such a small thing, but so much fun. We learned how to make craft stick chain reactions one rainy day and we had so much fun seeing how long we could make them before they sprung up all over the place. 45. 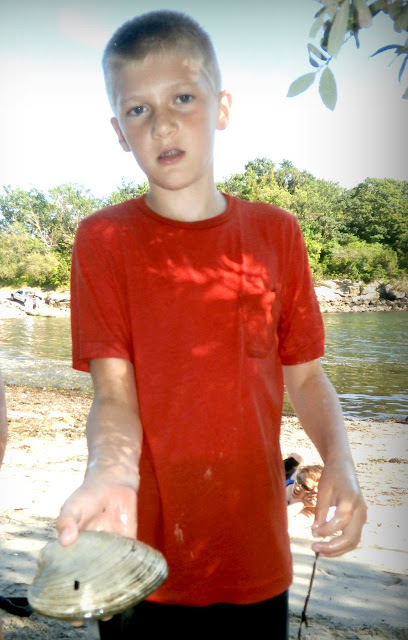 We found a quahog at the beach!-- We often finds all sorts of sea and animal life at the beach. This was the first time we've ever found a quahog and it was HUGE! 46. They went to an archery class and learned how to use compound bows- my boys have simple bows and targets and practice archery a lot. 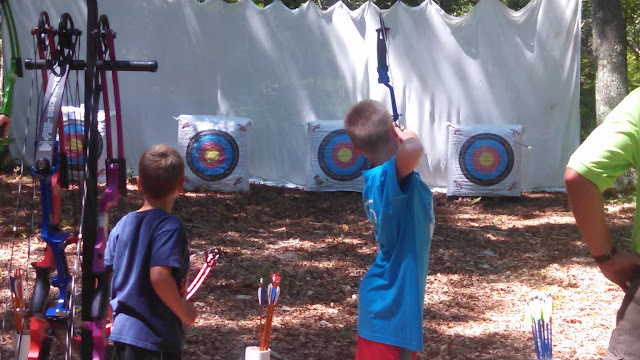 This one day we checked out a local class and the boys got a lesson in using compound bows. It was fun but a lot of work! 47. We made rainbow paper-- a fun, quick and easy science experiment we had so much fun making paper rainbows. 48. We made faux stained glass -- using the glass from some dollar store picture frames, glue and paint we made faux stained glass pictures one day. We learned that it's not as easy as it looks! 49. We made leaf skeletons -- one of our science experiments found us boiling leaves and wiping away all the coloring leaving just the fine lines of the leaf left. It was so neat to see all the details inside! 50. We attended our first EVER 4-H science club class -- It was fun and we enjoyed it so much we continued to go each month. 51. We made mason jar luminaries (fall and winter ones)-- we had fun making mason jar luminaries a few different ways. All craft projects require a slight learning curve but these were fun and the results are just beautiful! 52. We attended a few classes on Bio-luminescence-- We had the opportunity to attend a few classes learning about the adaptations of deep sea animals. It was so well done too and we had such a wonderful time learning about animals we had never even heard of! We also went to our first ever skate park, made punched tin can luminaries and tried countless new cooking and baking recipes-- it was a very good year! What a great idea, and a great list of these yall did! My middle three are in karate, and sparring us their favorite part, too! I think that would be my least favorite part; I know they wear gear and all but I am not a contact sport kind of person.